The Moon moves into Capricorn today and will stay there until Saturday. If you were to describe this transit using the Tarot, you might say that the High Priestess is wearing the Devil’s clothing. The virginal goddess has gotten downright beastly. 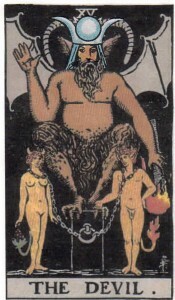 The Moon in Capricorn, or High Priestess in the Devil’s clothing, is a period of potential internal conflict. The physical world might seem to draw you away from what you typically believe to be right. You might feel driven or compelled by behaviours and attitudes that go against the grain of your morality. It could be liberating or disturbing, depending on your secrets. Whatever’s going on though, don’t be too hard on yourself. Get obsessions out of your system, and learn what you can about yourself while you do so. You should be ready to move on soon. There’s nothing wrong with a little focused physicality. Just don’t get stuck. You are currently reading Moon in Capricorn – High Priestess in the Devil’s Clothing at The Tarot Room.